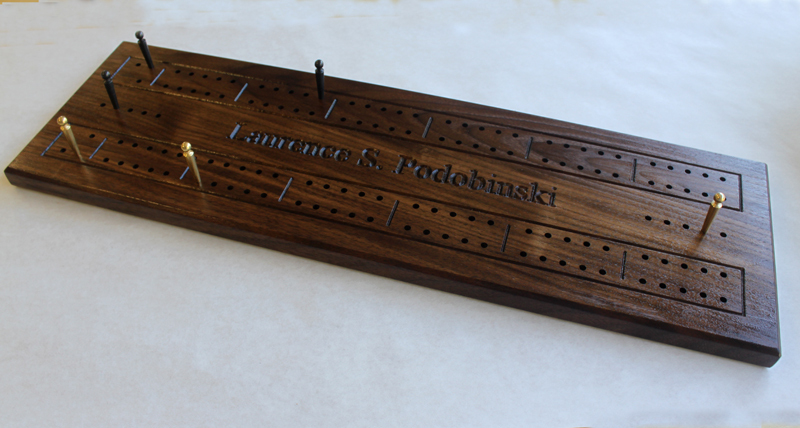 This is our giant two track engraved cribbage board. This board is designed to make play easy for those with limited vision or trouble grasping and moving pegs. 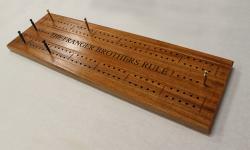 Each hole is 3/16" in diameter, and the board comes with six two-inch giant metal pegs. They live inside a pocket in the back of the board, secured by a sliding brass plate. This way, you'll never forget where you put your pegs! The board is 23" long, 7.5 inches wide and 3/4" thick, and usually weighs in at just under 4 pounds. It also comes with scoring holes and your name or phrase engraved in the center. Certainly an heirloom board that is hard to ignore!